Exuberantly British and quite possibly off its rocker, “Hellboy” is a crack pipe of a movie. Rebooting Guillermo del Toro’s 2004 and 2008 appropriations of Mike Mignola’s comic-book character — a rosacea-hued colossus with filed-down horns and do-gooder goals — the British director Neil Marshall turns all the dials to 11 and keeps them there. This aural and visual assault poses the question: Exactly how much stimulation do studios think audiences need? A great deal, apparently, as this new “Hellboy” (with David Harbour replacing the irreplaceable Ron Perlman as our knobheaded hero) tears through multiple countries, 16 centuries and a bevy of supernatural sources to save mankind from, among other things, a bunch of enraged giants. (The insane script, a bedlam of witches, fairies, Nazis and ectoplasm, is by Andrew Cosby.) In Hellboy’s way stands Milla Jovovich as a reconstituted sorceress (previously sliced-and-diced for our safety) and an array of imaginative weapons including electrified pigstickers, Excalibur and a proper English breakfast. No prizes for guessing which is the most deadly. dank dread and crawling terror of his 2006 spelunking stunner, “The Descent,” directs like a dog at a squirrel convention, charging gleefully from one witlessly violent encounter to the next. Ian McShane, as Hellboy’s adoptive father, does what he can to calm the chaos, but the movie left me alternately baffled and battered. 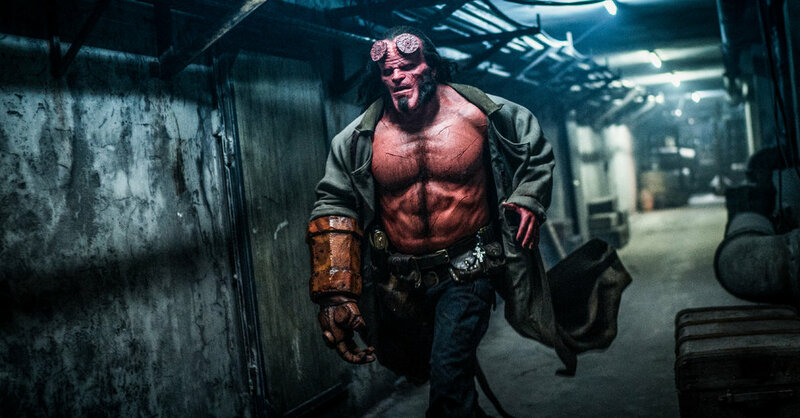 Be the first to comment on "‘Hellboy’ Review: What’s Big and Horned and Red All Over?"